Chapter 8: How Has the Monetary Transmission Mechanism Evolved Over Time? 5 WHAT CAUSED THE MONETARY TRANSMISSION MECHANISM TO EVOLVE? What tools are available for setting and analyzing monetary policy? World-renowned contributors examine recent evidence on subjects as varied as price-setting, inflation persistence, the private sector's formation of inflation expectations, and the monetary policy transmission mechanism. Stopping short of advocating conclusions about the ideal conduct of policy, the authors focus instead on analytical methods and the changing interactions among the ingredients and properties that inform monetary models. The influences between economic performance and monetary policy regimes can be both grand and muted, and this volume clarifies the present state of this continually evolving relationship. Graduate students through professionals worldwide working in all fields of economics and finance, and particularly in subfields related to labor economics. This volume is a must for anyone interested in the current state of the development of monetary theory as viewed by the community of most of the distinguished monetary economists. Both the work on monetary theory and the understanding of its importance have exploded in the last 20 years. This valuable compendium shows the enormous and detailed developments made recently. It highlights the problems in blending theory with institutions. It is a contribution of note. 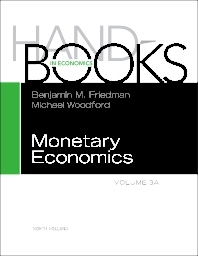 Monetary Economics has made great strides since the HANDBOOK OF MONETARY ECONOMICS, Volumes 1 and 2 was published. In Volumes 3A and 3B you will find surveys, written by leaders in their fields, of new work on foundations, the transmission mechanism, adaptive learning and expectation formation, optimal monetary policy, constraints on monetary policy, robustness in macroeconomics, monetary policy in practice, and much more, as well as applications to the latest crises. Every economist will want these volumes placed within easy reach on their bookshelf. Michael Woodford is the John Bates Clark Professor of Political Economy at Columbia University. His first academic appointment was at Columbia in 1984, after which he held positions at the University of Chicago and Princeton University, before returning to Columbia in 2004. He received his A.B. from the University of Chicago, his J.D. from Yale Law School, and his Ph.D. in Economics from the Massachusetts Institute of Technology. He has been a MacArthur Fellow and a Guggenheim Fellow, and is a Fellow of the American Academy of Arts and Sciences, as well as a Fellow of the Econometric Society, a Research Associate of the National Bureau of Economic Research (Cambridge, Mass. ), and a Research Fellow of the Centre for Economic Policy Research (London). In 2007 he was awarded the Deutsche Bank Prize in Financial Economics. Woodford’s primary research interests are in macroeconomic theory and monetary policy. He has written extensively about the microeconomic foundations of the monetary transmission mechanism, the role of interest rates in inflation determination, rules for the conduct of monetary policy, central-bank communication policy, interactions between monetary and fiscal policy, and the consequences of electronic payments for monetary control. His most important work is the treatise Interest and Prices: Foundations of a Theory of Monetary Policy, recipient of the 2003 Association of American Publishers Award for Best Professional/Scholarly Book in Economics. He is the co-editor of the Handbook in Economics series.